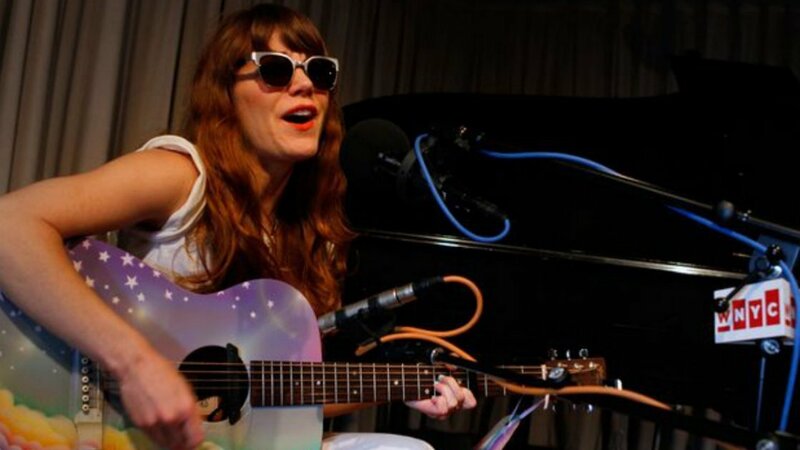 On Thursday, June 5th, Jenny Lewis stopped by the WNYC studios to do an interview and perform a few songs off her upcoming solo album, The Voyager, set for release on July 29th on Warner Brothers Records. Listen to the whole thing above. The session began with Lewis playing a stripped down version of the first single off The Voyager, the Beck-produced "Just One Of The Guys." The acoustic nature of the song showcases a lot of the vulnerability in the lyrics. She focuses on getting older, her own insecurities and her own fears. Musically it continues Lewis' trend toward country that she began on her first solo album, Rabbit Fur Coat. She ended her set with "The Voyager." The song features a delicate piano and great harmonies from Megan McCormick and Natalie Prass. In the interview Lewis talks about the new record and her projects she's been working on since her last solo album, Acid Tongue, came out six years ago. She recorded The Voyager with Ryan Adams, who produced all of the tracks except for one, and talked about her experience working with him. For the past few years, she has been writing for films. The first, Song One, came out this past January, and there is another, entitled Very Good Girl, coming out this July. The Voyager is available for pre-order on iTunes. For more information on Jenny Lewis, including music, news and upcoming tour dates check out her Zumic artist page.